John Christian "J. C." Wenger: churchman, author, and seminary professor; born 25 December 1910, near Honey Brook, Pennsylvania, USA, to Aaron Martin Wenger (1884-1960) and Martha A. (Rock) Wenger (1889-1975). He was the oldest child in a family of three sons and two daughters. On 3 April 1937 he married Ruth Derstine Detweiler (19 December 1906, Sellersville, Pennsylvania - 19 February 1992, Goshen, Indiana). They had four children: Daniel, John, Mary, and Elizabeth. Wenger died 26 March 1995 in Goshen, Indiana, USA. Wenger was baptized 11 May 1924 in the Rockhill Mennonite Church at Telford, Pennsylvania. He was a lifelong member of the Mennonite Church, the largest North American Mennonite denomination during Wenger’s lifetime. J. C., as he liked to be called, always retained the faith learned from his parents and formed in the Rockhill congregation, where the family moved in 1923. He attended Eastern Mennonite College (now University), and graduated from Goshen College in 1934. Wenger did graduate study with J. Gresham Machen at Westminster Seminary, and worked with such notable scholars as Karl Barth at the University of Basel and Emil Brunner and Fritz Blanke at the University of Zurich, from which he received the Th. D. in 1938. He later acquired an M. A. in philosophy from the University of Michigan. Along with a teaching career first at Goshen College and then at Goshen Biblical Seminary (now part of Anabaptist Mennonite Biblical Seminary, Elkhart, Indiana), Wenger held many church-wide offices. Often referred to in later years as "the beloved J. C.," he traveled continually to speak in congregations across the Mennonite Church. A prolific author, Wenger edited six books, and wrote some 20 books as well as many booklets and numerous popular and scholarly articles. Important books include History of the Mennonites of the Franconia Conference (1938), (which also served as his doctoral dissertation), Glimpses of Mennonite History and Doctrine (1947), Separated Unto God (1951), Introduction to Theology (1954), and Even Unto Death (1961), which was translated into German as Die dritte Reformation (1963). Wenger’s God’s Word Written (1966) was important for its gentle affirmation of historical scholarship on the Bible. Wenger derived great satisfaction from being a member of the Committee on Bible Translation that produced the New International Version, the translation most used by Evangelical and conservative Christians in the United States. As a churchman, Wenger’s irenic spirit did much to hold disparate factions of the church together. Wenger was a protégé of Harold S. Bender, who recruited him for the ministry and Bible teaching from a planned career in medicine. Wenger became Bender’s confidant and advocate. One of Wenger’s major church-wide contributions was to popularize Bender’s "Anabaptist Vision" school of thought. It was a major focus of his teaching and speaking as well as in such writings as Glimpses of Mennonite History and Doctrine and Even Unto Death, which told the story of 16th century Anabaptists. Although Wenger’s formal theology was shaped in conversation with fundamentalism, it had an irenic spirit, rounder edges, and more flexibility than classic fundamentalism, with a strong dose of Wesleyan holiness mixed in as support for traditional Mennonite ethics. On the culturally progressive side of the Mennonite Church spectrum in his youth, to please conservatives when he was ordained, Wenger adopted the "plain coat," a collarless suitcoat worn without a necktie. In later years, he became the symbol of this style, continuing to wear the plain coat to the end of his life after most church leaders abandoned it in the 1970s. Wenger’s books such as Separated Unto God and Introduction to Theology, which served as primary sources of Mennonite Church beliefs in the third quarter of the 20th century, linked classic, conservative theology with plain dress and the Mennonite ethic of pacifism. Wenger frequently referred to European experiences from the time he studied in Switzerland, and he valued attending Mennonite World Conference in Basel in 1952. 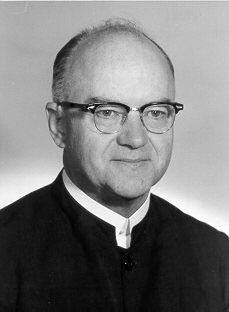 His primary interaction with European Mennonite leaders occurred during the term he served on the Presidium of Mennonite World Conference in the 1960s. Toews, Paul. Mennonites in American Society, 1930-1970: Modernity and the Persistence of Religious Community. The Mennonite Experience in America, vol. 4. Scottdale, PA: Herald Press, 1996. Wenger, John C. J. C.: A Life Sketch. Goshen, IN: Historical Committee of the Mennonite Church, 1993. Wenger, John C. "Sought and Found." In They Met God: A Number of Conversion Accounts and Personal Testimonies of God’s Presence and Leading in the Lives of His Children, ed. by John C. Wenger. Scottdale, PA: Herald Press, 1964: 169-175. This article is based on the original English article that was written for the Mennonitisches Lexikon (MennLex) and has been made available to GAMEO with permission. The German version of this article is available at http://www.mennlex.de/doku.php?id=art:wenger_john_christian. Weaver, J. Denny. "Wenger, John C. (1910-1995)." Global Anabaptist Mennonite Encyclopedia Online. December 2012. Web. 26 Apr 2019. http://gameo.org/index.php?title=Wenger,_John_C._(1910-1995)&oldid=154489. Weaver, J. Denny. (December 2012). Wenger, John C. (1910-1995). Global Anabaptist Mennonite Encyclopedia Online. Retrieved 26 April 2019, from http://gameo.org/index.php?title=Wenger,_John_C._(1910-1995)&oldid=154489. This page was last modified on 28 September 2017, at 19:15.